According to the U.S. Mint’s product schedule, the main releases for the month include rolls and bags of Arches quarters and rolls, bags and boxes of Hover $1 coins. There is also a five-ounce silver coin release and set of the quarters. Prices and release dates, as the U.S. Mint notes, are subject to change. Numismatic products launch at Noon (ET) on the day of their release. Orders may be placed through the U.S. Mint website at www.usmint.gov or by phone at 1-800-USA-MINT (872-6468). The 23rd America the Beautiful Quarter begins to enter circulation and becomes available in U.S. Mint products on June 9, 2014. Featuring the well-known 65-foot freestanding Delicate Arch, Arches National Park Quarters are available in quantities ranging from 40 coin-rolls to 100-coin bags and in prices from $18.95 to $45.95. Buyers have product choices of coins from U.S. Mint facilities in Denver, Philadelphia or San Francisco. The three-roll set is the most expensive product, but it includes a 40-coin roll from each facility. All product options include Arches National Park Quarters in circulating quality. This coin is the third of five 2014-dated America the Beautiful Quarters with the past two quarters honoring Great Smoky Mountains National Park in Tennessee and Shenandoah National Park in Virginia. This year is one of the more unique ones as all quarters honor a national park. Most years there is a mixing of quarters that celebrate national parks and other national sites, like forests or memorials. 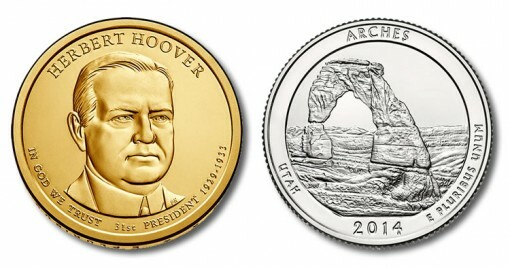 In a continuing celebration of Arches National Park, three-inch coins struck in five ounces of 99.9% pure silver and bearing the same designs as the Arches quarter launch on June 12, 2014. The Arches National Park Five Ounce Silver Uncirculated Coin currently has a price tag of $154.95. There is a possibility for the coin’s price to move lower considering the more than 2% fall of silver prices in May. When the last five-ounce coin honoring Shenandoah National Park was released on May 15, the London silver Fix was $19.66 an ounce. Silver on Friday, May 30, dropped toward $18.80 an ounce. Silver prices will probably need to move lower for the U.S. Mint to make a pricing change, so collectors will be watching the precious metal closely in June. Rolls, bags and boxes of Herbert Hoover Presidential $1 Coins go on sale on June 19, 2014. 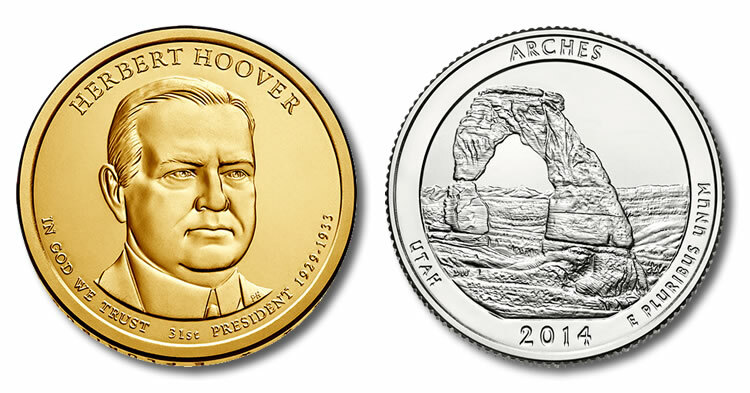 Hoover $1 coins are the third of the four Presidential dollars for this year, the 31st in the series. All dollars are in circulated-quality, though they have never been placed into circulation. $1 coins are no longer distributed for circulation but the U.S. Mint still strikes them for collectors and numismatic products. Buyers have the choice of Hoover $1 coins from either the Denver Mint or the Philadelphia Mint. Finally, wrapping up the month is the three-coin set of Arches National Park Quarters for $9.95. Within the set are two uncirculated coins — one from the Denver Mint and one from the Philadelphia Mint, and one proof coin from San Francisco Mint. Uncirculated and proof coins are struck only for numismatic products. The three-coins are held within a durable plastic card that features an attractive photo of the national park.